Your hot pink walls look like the last days of the Raj with pink-and-green taffeta tattersall drapes, and the visual heat suits you like chili peppers. The off-white walls in your rental are blander than unbuttered toast, and all you can change are the window curtains. The nursery has purple walls -- will you risk the baby's eyes with orange and white striped curtains? Curtains and wall colors have an intimate relationship, a mutual dependence that can make or break your decor. Match curtains to the walls so your small room seems more spacious, but add a block or a stripe of color to the curtains to keep the space from getting dull. Toast walls with white trim and toast taffeta drapes could be coma-inducing -- but not when the drapes are slashed across the bottom half with a broad band of mallard taffeta. The jolt of color gives you license to cover the sofa in mallard velvet, or add an abstract carpet in mallard and toast. One or two daffodil silk throw pillows take the subtle room from understated to striking. A shared room with peach walls and curtains is lively enough for tweens when the curtains are bisected with a color block of purple. That lets you add purple shag bedside rugs, a purple dresser, and patchwork quilt bedding with blocks of peaches and plums as part of the design. Curtains brush, lean, float, drift and rest against the walls -- the juxtaposition is unavoidable. If fabric and paint are to fuse into a seamless gradation, assign the curtains a tone the same as the wall's, but a few shades darker. Heavy cream walls, with their hint of yellow, are a rich foil for maize curtains. Palest pepper-green walls work with fern or moss watered silk. Mix it up with walls and drapes that pick up colors from the carpet. A cerulean, ivory and cinnabar Oriental pulls together pale blue walls and cinnabar-sapphire-and-ivory patterned curtains. 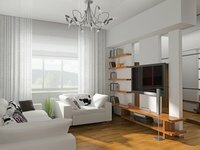 Neutral color curtains wear better than vivid hues in a sunny room. Any fading of the material won't show, and the absence of a commanding color draws attention to bright walls or blends in with champagne wallpaper or wheat-colored matte paint. Try oyster-white lined faux silk curtains against slightly glossy oyster trim and flat oyster-white walls for clean elegance. If it's a formal room, the curtains pool on the floor for added drama. Drift snowy sheers across windows in a pure white-walled room and block light with inset white shades that roll up out of sight by day. Pewter velvet drapes in a dove-gray room are both theatrical and understated. Toss in a purple velvet sofa and chartreuse brocade chairs for royal decadence. Stick to a gray linen sofa and charcoal and vanilla striped brocade chairs for something more buttoned down. A room that gets a lot of light changes color with the curtains. When the sun shines through unlined fabric, a bright color will tint the lighter walls of the room. A similar effect occurs when light bounces off shiny vivid curtain colors and is reflected on the walls. Vanilla, apricot blush or white walls in a dining room with ceiling-to-floor scarlet and gold striped taffeta drapes reflects a warm glow and enhance the warmth of polished wood furniture. Light beaming through rose-colored curtains tints pale walls a healthy, pinkish color. Sunlight filtering through blue drapes might make a pale blue, white or cloud-gray room mysterious, or depressing. Test curtain fabric with all light conditions in a room when possible before choosing the fabric and wall colors.